Amir Khan isn’s the one to mince his words. So, what he has said of Anthony Joshua’s upcoming fight with Alexander Povetkin is not surprising at all. Joshua, the IBF, IBO, WBA and WBO heavyweight champion, is set to trade punches with fellow Olympic gold medallist Povetkin at Wembley Stadium come September 22. 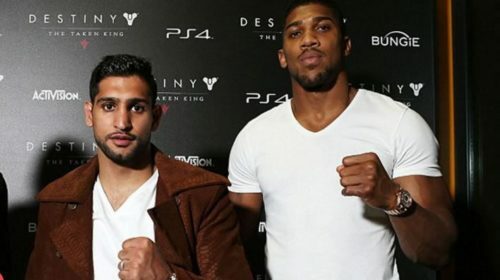 But, for all the promise Povekin carries inside the ring, his 6’2” frame will be no match for the 6’6” Joshua, feels Khan. “Povetkin is a good fighter and he was at the same Olympics as me (in 2004). He’s an Olympic gold medallist. We’ve known him since then and he’s a tough guy,” Khan told ES News (via WBN). Khan, a former two-time world champion, also spoke of a potential fight with Filipino legend Manny Pacquiao. Pacquiao, the only eight-division world champion, scored his first KO win in over nine years after stopping Lucas Matthyse to win the WBA welterweight title. “Manny looked good, he boxed well. It was a great performance and he looked very sharp,” he said. “I think it’s a good time for me to fight him as we are both coming off good wins.